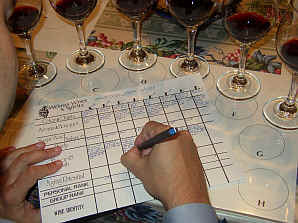 The 2000 vintage has been described as "uneven" by many critics. We, frankly, find most vintages to be "uneven" if you're looking for great wines. 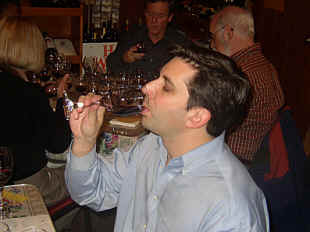 This tasting was a snapshot of the vintage, featuring wines carrying suggested prices of $35 to $50. 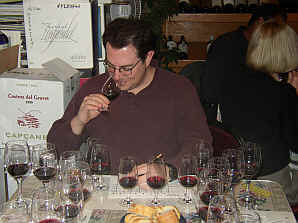 But most of the tasters found these wines to be lacking the character which would help justify such pricing. Given that the Napa Valley does not have exclusive rights to producing world class wine on this planet, it may behoove vintners to consider a more stringent standard as to what they will put in the bottle at these prices. 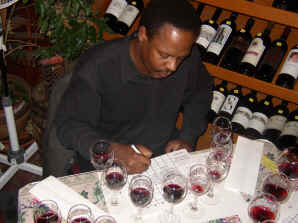 Bordeaux, for example, was frequently taken to task for its pathetic wines in so-called "small" vintages. 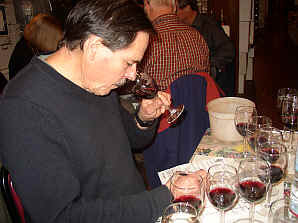 But if you taste the wines from the "small" vintages of the past years, you'll notice a major improvement in the wines. That's because even less prestigious properties are declassifying a significant percentage of wine and offering "second" or lesser quality wines under secondary labels. It seems many California vintners feel obliged to bottle as much as they can, each and every vintage and at as high a price as the market will bear. We'd like to suggest that wineries consider offering the consumer a reason to buy a second bottle of their products; something we did not find after tasting this set of wines. One wine was moderately ahead of the pack, but nothing in the tasting was especially impressive. A $15 or $20 on these wines would have been appropriate, but when they sell for serious money and are serious under-achievers, most wine drinkers lose interest. One taster described this as "nasty," while another said "It's lousy...no body...distasteful." Someone else found notes of "Rye seed, pickle barrels and it's light, thin and watery." Another panel member detected "Pickles, dirty socks and on the brighter side, it got worse over time!" More positively, one critic noted "Cedar, plum skins, sage brush and a subtle vanilla finish." I found floral aromas in this mildly candied red. There's a vague hint of mint. On the palate, this is really scrawny and hardly a "grand vin" of $50 value. It's the consumer who's conned here. No stars on my three star scale, zero being standard (or worse) and three being exceptional quality. One person found this lacking aroma. But a second taster described it as "Complex, well-balanced with notes of chocolate and vanillin oak, along with earthy, cheesy fragrances and some dried horse leather with a long, rich oaky aftertaste." Another person found "cooked fruit notes with blueberry overtones and a short finish." It was described by someone else as "Earthy, stemmy with green, unripe fruit notes yet complex, big tannins and deep intense fruit on the palate." A fifth critic found "dried roses and some moldy notes." Two others detected "off" aromas, one asking if it was corked and another saying they encountered "cellar smells." I, also, found some faint cellar aromas here, with stalky fruit components and an herbal quality. It reminded me of a wine that had been aged in old cooperage such as redwood tanks. I finally concluded it was a wine of standard quality and somewhat along the lines of small vintages of old Louis Martini Cabernets of the 1960s and early 1970s. No stars. One critic described this as being "Subtle, supple and rich with mocha-infused oak along with notes of minerals, mushrooms and boysenberry fruit." A second critic found it to be "sour and bitter." A third asked if it was corked or musty. Someone else suggested it may have some H2S (hydrogen sulfide, a rotten egg sort of character). "It's weedy, herbal, grassy and prickly, like there's something wrong." One optimist said it was "Awful to start but opened for the better." A final critic felt it was merely "simple." I detected herbal and resin notes on the nose, with a hint of eucalyptus. There's a nice cherry fruit on the palate with a core of sweet herbs such as Marjoram and Sage. It's not terribly tannic and is drinkable now-2007, or so. I gave it a one star rating. "This is really bitter and tannic!" screamed one critic. 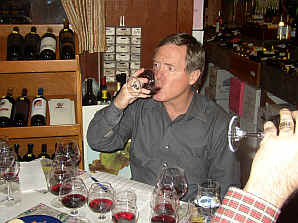 Another agreed, saying "It's very tannic and has ripe, currant-like notes with some blueberry fruit and sweet oak." Someone else found it to be the "Most full-bodied wine with big plummy and currant fruit, but with huge tannins and a watery quality on the finish." A final set of descriptors from another taster: "Firmly tannic with unripe berry and cedar along with an oak and balsamic finish." I detected some dark, ripe fruit notes here, but it seemed a bit muted, with a hint of a leathery fragrance. It's very coarse and tannic, definitely needing cellaring. Five to ten years may resolve some of the tannins, but it's likely to remain a bit out of balance. I gave it a one-half star rating. "This shows rich, smooth, sage along with some mocha notes, plush currant fruit some chocolate with subtle vanillin oak on the finish." said one fan. But another taster described it as "Short and simple." A third person detected "sour, bitter cherry fruit." A fourth taster noted "It's got peppermint, herbs, coffee tones with pencil shavings and ripe elements, yet it's really tart." A fifth critic found notes reminding her of "carrots." A final word was that it's "well-balanced." I found the wine to remind me of some Australian red wines with its intense violet fruit and mint notes. The same qualities appear on the palate and it's a pleasant enough wine but, like most of the rest in this tasting, not a "grand vin," but a "nice little wine." One critic found "charcoal and cough medicine notes" in this Napa Cabernet. A second critic notes elements of "candy and artificial raspberry flavors." A third found "wet cardboard, lavender, baked plums and candied fruit." Someone else detected "citrus, cedar and stewed plum notes." Another person felt it has "Nice, full fruit with red cherry, raspberry, plum and black cherry elements. But it's not for cellaring, being nice now." A final fan say it was "Number One! Delicious!" I encountered notes reminiscent of cherry cola and a mildly meaty quality with a fragrance reminding me of talcum powder. These features are confirmed on the palate and the wine has mild tannins. I gave it a one-half star rating. "This is a youthful, rough-hewn, smoky, plum-like Cabernet with green herbal notes and a disturbing cough syrup finish." Another critic felt it was "light, sour and weak. It's not balanced in terms of oak and fruit." Taking issue with that assertion was one person who felt it was the "Most balanced wine of the tasting, with lightly herbal notes and ripe berry fruit. 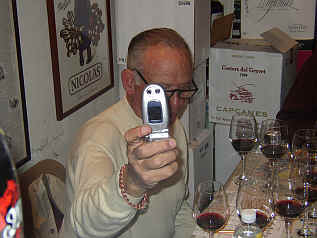 It's a really nice $15, everyday sort of Cabernet." I found some black cherry fruit, a touch of cedar and vanillin on the nose. It's cherryish on the palate, too, with mild tannins. I gave it a one-half star rating. Our first place wine was said to be "The worst wine of the tasting as it's tightly wound, shows bitter olive notes, herbs, earthy tones, camphor and petroleum qualities on the finish." Another critic found "Slightly over-ripe notes and herbal qualities." Another taster found "Metallic, sour, grassy notes with a charry character and it's rather tannic, with oak." Another critic said "There's room for improvement here" to which another wag added "Well, it's red." 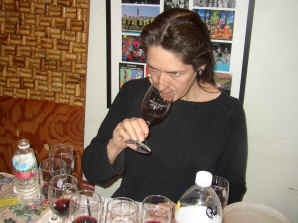 I was more positive about the wine, finding some currant fruit, a lightly herbal element and some woodsy fragrances. The same features shine on the palate and it was one of the few wines with any substance and depth on the palate. I gave it a one star rating.